The global cake mixes market is envisaged to display steady growth in the upcoming years while riding on the rising disposable incomes in several parts of the world. With increasing spending by consumers on food items that satisfy the taste buds, the demand for cakes, and consequently cake mixes is receiving an uptick. From the first cake mixes that were introduced in the early 1930s to find a use for the molasses surplus of a molasses canning company, cake mixes have evolved leaps and bound in terms of flavors and type. Apart from the regular type, today, cake mixes are available in several variants such as sugar free and low fat to serve special dietary needs. The introduction of organic cake mixes that are free of chemical additives is gaining popularity among health-savvy consumers for their food preferences. A report by Transparency Market Research (TMR) predicts the global cake mixes market to attract an opportunity of US$1,098.7 mn in 2017. Rising at a moderate 3.6% CAGR for the forecast period between 2017 and 2022, the market will likely touch a valuation of US$1,310.7 mn by the end of the forecast period in 2022. The global cake mixes market could be classified into chocolate, vanilla, butter, milk, fruit, red velvet, berries, butterscotch, and others, according to flavor. Among these, the chocolate segment is anticipated to garner the lion’s share by the end of the forecast period. As per the TMR report, the chocolate segment could be valued at US$426.5 mn by the end of 2022 to represent 32.5% of the overall market. The absolute growth attained by the chocolate segment is expected to surpass that of any other segments in the category. Between 2017 and 2022, the chocolate segment could rise at a year-on-year growth of US$15.4 mn. With respect to distribution channel, the key segments of the cake mixes market are modern trade, departmental and traditional grocery store, convenience stores, online channels, and other retail formats. In terms of cake type, the key segments include angel food cake, layer cake, flourless or low-flour cake, cup cake, cheese cake, pound cake, tortes cake, unbaked cake, and other. On the basis of geography, the worldwide market for cake mixes is studied across North America, Europe, Asia Pacific except Japan, Middle East and Africa, Latin America, and Japan. North America cake mixes market is envisioned to be dominant amongst all to attract a revenue of US$431 mn by 2022 after progressing from US$353.7 mn in 2017. The region is poised to display a significant 4% CAGR over the forecast period of 2017 to 2022. 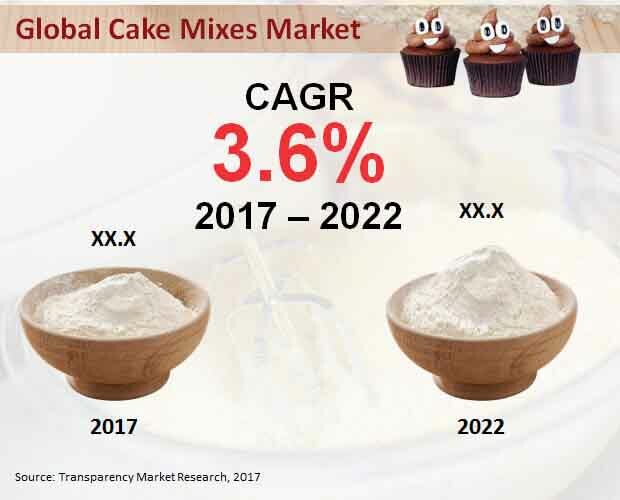 Europe is predicted to be another key market for cake mixes to attract a revenue worth US$362.7 mn by 2022, expanding at a CAGR of 3.2% over the forecast period. Asia Pacific except Japan is anticipated to represent 20.5% of the overall market in 2017; going forward the region is estimated to gain 11 basis points (BPS) between 2017 and 2022. On the other hand, the Middle East and Africa and Japan are anticipated to display sluggish growth over the forecast period. While the former is estimated to represent 4.8% revenue share by 2017 end and lose 27 BPS between 2017 and 2022, the latter is expected to hold 3.8% revenue share in 2017 and lose 13 BPS by 2022 over 2017. Leading players in the global cake mixes market include General Mills Inc., Associated British Foods Plc., Archer-Daniels-Midland Company, Pinnacle Foods Inc., Cargill Inc., Ingredion Incorporated, Hain Celestial Gropu Inc., Kerry Gropu Plc., Continental Mills Inc., and Chelsea Milling Company. The research report on the global cake mixes market presents a detailed overview of key market dynamics during the forecast period of 2017 to 2022 with 2016 as the base year. The market size of the global cake mixes market has been provided in terms of revenue and volume. The research presents insights into the share and size of various segments during the 2012-2017 period and analyzes various trends boosting the demand for prominent segments. These segments have been identified based on present and future trends. In addition, the report provides revenue share of key regions and highlights important developments influencing these regional markets over the forecast period. This information is used to provide market attractiveness analysis by geography. A detailed qualitative analysis of drivers, restraints and opportunities has been covered in the market overview section of the report. It also covers the impact of these drivers and restraints on demand for cake mixes over the forecast period. The report covers a thorough analysis of the overall competitive scenario in the cake mixes market along with market share analysis of key players. The objective of the report on global cake mixes market is to ascertain and provide projections about the market’s growth trajectory during 2017 to 2022. It analyzes opportunities in the market for new entrants and also delineates a competitive chart of this growing market. The report is compiled as a result of primary research that comprised the major research phase, along with secondary research to compute market size. The report comprises projections for revenue generated by sales of cake mixes via several distribution channels over the forecast period. TMR not only provides projections in terms of value, but also evaluates the market based on essential parameters, such as year-on-year (Y-o-Y) growth. This helps readers to gauge future opportunities in the market. On the basis of flavor, the global cake mixes market has been segmented into chocolate, vanilla, butter, milk, fruit, red velvet, berries, butter scotch, and others. Based on cake type, the global cake mixes market has been bifurcated into angel food cake, layer cake, flourless or low-flour cake, chiffon cake, cup cake, cheese cake, pound cake, tortes, unbaked cake, and others. Depending upon distribution channel, the market has been categorized into modern trade, departmental and traditional grocery store, convenience stores, online channels, and other retail formats. Geographically, the report assesses the global cake mixes market in the regions of North America, Latin America, Europe, Asia Pacific except Japan, Japan, and the Middle East and Africa. Some of the key countries in these regions that have considerable scale for sale of cake mixes are the U.S., Canada, Brazil, Mexico, Argentina, Germany, the U.K., France, Spain, Italy, Nordic, Japan, China, India, Malaysia, Thailand, Singapore, Australia, GCC Countries, South Africa, Nigeria, and Israel. A revenue comparison based on flavor, distribution channel, and cake type for each of these countries is provided in the report. General Mills Inc., Archer-Daniels-Midland Company, Associated British Foods plc., Pinnacle Foods Inc., Cargill Inc., Ingredion Incorporated, Hain Celestial Group Inc., Kerry Group plc., Continental Mills Inc., and Chelsea Milling Company are some of the key companies for cake mixes profiled in this report. Details such as product portfolio, recent developments, business strategies, financials, and SWOTs are provided for each of the companies in this report.